What's in the Sysco Healthcare Brochure? In our Healthcare Brochure Download we look primarily at how a solution from Sysco Healthcare can provide a single view of Procurement, Customer Service and Human Resources that will allow a healthcare organisation or business unit to Capture, Manage and Report on the key performance indicators they need to make sometimes difficult strategic decisions – removing the need for guess work and keeping everyone on track. An overview of how Sysco Healthcare provides a single view of Suppliers, Customers and Employees and how we can provide process to any healthcare workflow. An overview of how Sysco Healthcare enables any department to track new and existing business suppliers; from acceptance and on-boarding through to procurement and subsequent monitoring of service delivery. An overview of how Sysco Healthcare streamlines all interactions across your healthcare organisation from unique, role-tailored user dashboards. An overview of how Sysco Healthcare can be used to map case management workflows for any case type. An overview of how Sysco Healthcare can integrate paperless document management through both digital transformation and digital file cloud storage. An overview of how Sysco Healthcare can be used from any location to access and track information with the security in place to restrict access to sensitive data. An overview as to how Sysco Healthcare provides external Web Portals for suppliers and employees to access and record key information. 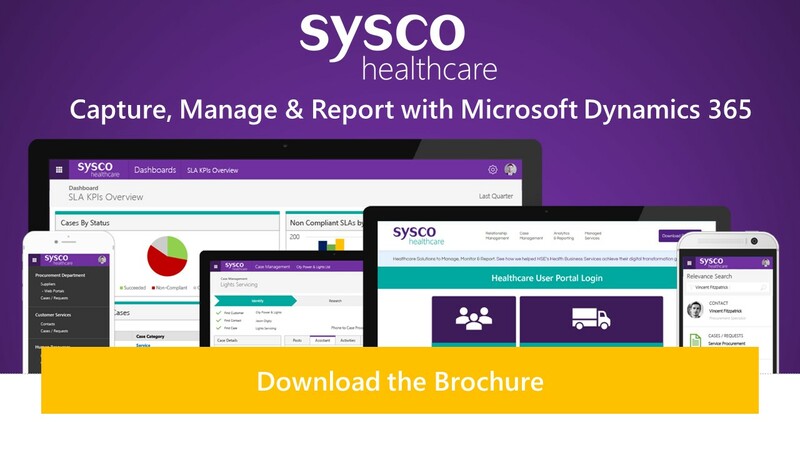 An overview of how Sysco Healthcare can integrate seamlessly with Microsoft Office 365 and Outlook.